Tess Lohan is the kind of woman we meet and fail to notice every day. A single mother. A nurse. A quiet woman, who nonetheless feels things acutely—a woman with tumultuous emotions and few people to share them with. 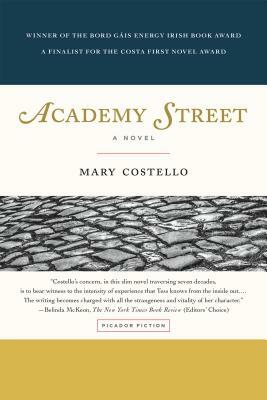 Academy Street is Mary Costello’s luminous portrait of a whole life. It follows Tess from her girlhood in western Ireland through her relocation to America and her life there, concluding with a moving reencounter with her Irish family after forty years of exile. The novel has a hypnotic pull and a steadily mounting emotional force: It speaks of disappointments but also of great joy, capturing, in sentence after sentence, the rhythm and intensity of inner life. Mary Costello grew up in Galway and now lives in Dublin. Her collection of stories, The China Factory, was nominated for the Guardian First Book Award. Her first novel, Academy Street, was named Book of the Year and Eason Novel of the Year by the 2014 Bord Gais Energy Irish Book Awards and was shortlisted for the Costa First Novel Award.